Go ahead, click the Facebook “Like” button on your friend’s cat picture. Don’t think twice about it. You’re being a good netizen who participates in collegial dialogue and keeps the world safe for democracy. And you are being a good friend. Facebook’s multibillion dollar IPO has been valued, as least in part, on the capture of just this kind of personal data from the “Like” click. What seems innocuous—or at least innocent—to the average user, translates into monetary benefit for the Company and its many advertisers and affiliates. Seven years of data from approximately 800 million users will drive considerable targeted advertising and resulting revenue for Facebook and related entities. And if that doesn’t work, Facebook has many other avenues for continued success as a versatile communications company. So WPP chief executive Sir Martin Sorrell can stop his handwringing about Facebook’s bad plan to monetize via advertising and commercial messages, which is the business of WPP. Mr. Sorrell thinks that Facebook is better suited as a “PR and word-of-mouth medium.” Somebody should reacquaint Mr. Sorrell with the theories of Joseph Schumpeter, the latest edition of What Color Is Your Parachute?, and make sure he has a LinkedIn profile. As Facebook, Google, Twitter, and other social networking companies ramp up their monetization, the worldwide battle is heating up over user privacy and regulation of personal data. 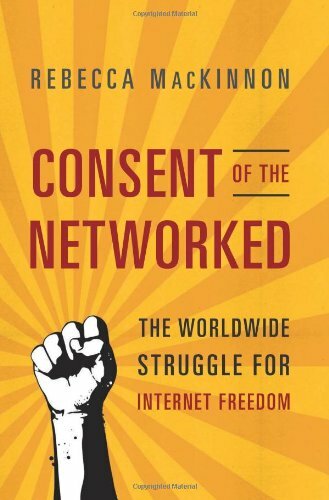 Such are the many concerns of Rebecca MacKinnon in her in-depth study, Consent of the Networked: The Worldwide Struggle for Internet Freedom. Ms. MacKinnon has the credentials to be in the middle of this battle. A former CNN Beijing Bureau Chief and Correspondent from 1998–2001, she was a Research Fellow at Harvard University’s Berkman Center for Internet and society and is co-founder of Global Voices with Ethan Zuckerman. Global Voices, a true product of the Internet, brings together hundreds of bloggers and translators worldwide with an “emphasis on voices that are not ordinarily heard in international mainstream media.” It’s the counterculture Huffington Post. Internet freedom is a difficult subject area to explain because so much of it happens daily, online, in the context of communications and commerce. It’s not physical, but ethereal, with places carved out of digital rather than physical spaces. As a result, many people don’t consider the Internet a threat to their environment, but it is, depending on where in the world one wants to exercise free speech and thought. Ms. MacKinnon provides expert reporting and analysis of Internet censorship and acts against individuals by authoritarian regimes around the world including China, Iran, and Egypt, among others. Communication doesn’t move in a straight line, and more often than not, it occurs outside the channels of what many of us would prefer. As always, the companies that control the means of communication, whether it’s the printing press, telephone wires, airwaves, or digital spaces, get the power and influence. And for the Internet, the content doesn’t even have to be paid for; the users bring their own. Compared to television networks, Internet companies have very little overhead, but do have many new “freedom of expression” issues everywhere in the world. Unlike more established communications media however, Internet companies don’t know how to communicate effectively to their customers. Perhaps because these companies are run by technologists, the key to clear, concise prose to explain policies and governance seems consistently to allude them. To this excellent study, Ms. MacKinnon should have added LinkedIn. This business-related social networking site has as much influence as Facebook, Twitter, and Google, and has turned at least part of the traditional human resources world upside down. LinkedIn has a more purposeful membership (networking, employment) than do the other services, plus a superb leadership team at the top. Interviews with the founders and executives of these companies, including Mark Zuckerberg (Facebook), Larry Page and Sergey Brin (Google), Jack Dorsey (Twitter), and Reid Hoffman (LinkedIn), would have revealed more about why and how these business leaders/entrepreneurs made (and continue to make) the decisions which impact so many. To open the window a bit more, Amazon is another key player on the commerce side moving into social media. For those who want to know the nuts and bolts of Internet governance, the author dives into the workings of the group which controls domain naming policies, ICANN (Internet Corporation for Assigned Names and Numbers). Kudos to Ms. MacKinnon for making sense of a very complex, important but often neglected area of Internet development. But the analysis would have benefited from direct interviews with any of a number of principal founders and policy makers. This isn’t ancient history. Almost everyone involved in the founding of ICANN and the larger domain naming contretemps of the 1990s is still alive and ready to talk. It’s the right time for the oral and video histories of the Internet. What would happen if Ms. MacKinnon went to work for Facebook? Or LinkedIn? Or Google? She could participate in the hundreds of daily decisions that keep the people who run and work at these companies very, very busy and constantly challenged. Perhaps her next book will be an account from the other side of the game.